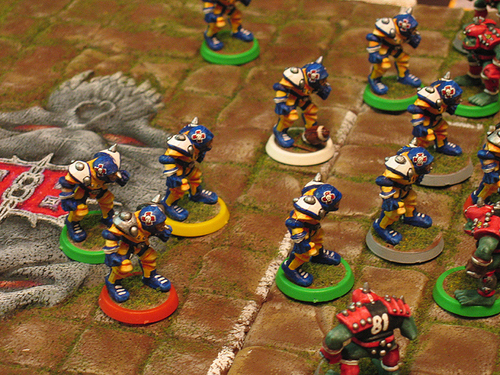 We’re kicking off the Wigan Wargames 2014 Blood Bowl League this Friday and the coaches have the optional use (provided they agree beforehand) of this revised kick-off table. Feel free to use it in your own games. The fans exact gruesome revenge on the ref for his dubious decisions and his replacement is more lenient – in fear of his life. Each team gains 2 bribes for the remainder of the match. When using a bribe, roll a D6. On a 2-5 it works, but a 1 means the player’s antics are too despicable to go unpunished and he is sent off (wasting the bribe). The ball is cursed by Tzeentch and will turn the next player to hold it into a slug. The kicking team may kick it directly at a player of their choice who, in accordance with the rules, MUST try to catch it. The first player to catch or pick up the ball has the remainder of the turn to get rid of it (pass/hand-off) before they are transformed into a gastropod (missing the rest of the game). If they still hold the ball at the end of the turn it bounces in the square they are in as they mutate. Touch-backs will not turn a player into a slug – the ball-boy will be transformed and Tzeentch’s curse will be wasted. If a player on the kicking team catches the ball they are turned into a slug prior to the touch-back.